Will Congress Save the U.S. Postal Service? Postal reform hit yet another snag on Wednesday after a scheduled House committee vote on a new piece of legislation was postponed due to a lack of bipartisan support. Rep. Darrell Issa, R-Calif., chairman of the House Oversight and Government Reform Committee, announced the delay just hours before a markup of his new bill overhauling the U.S. Postal Service was scheduled to begin. Issa introduced a bill to mirror a proposal put forward by the White House in President Obama’s fiscal 2015 budget proposal. 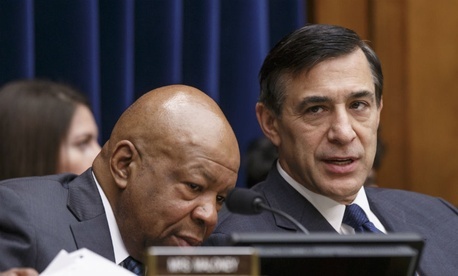 The committee previously passed an Issa-backed bill requiring more significant cuts without any Democratic support. Issa said during a hearing last month that he hoped by offering provisions backed by the White House, he could achieve a bipartisan bill. Issa sent a letter to the committee’s ranking member, Rep. Elijah Cummings, D-Md., on Tuesday asking for his -- and the rest of the committee Democrats’ -- support on the new legislation. The chairman said after not hearing back from Cummings he would postpone the markup. Issa explained he offered a version of the president’s proposal with slight alterations to draw the backing of Democrats, such as a requirement for six-day package delivery and the removal of language to permanently increase rates. Democrats responded with trepidation, however, and Issa drafted a bill that mirrored exactly the White House plan. A Democratic committee staffer told Government Executive Cummings would not support the bill. Obama’s proposal would eliminate mail delivery on Saturdays, but the staffer said “there is widespread, bipartisan opposition to cutting mail delivery to just five days per week.” The aide added “discussions are ongoing” between USPS management, labor unions and stakeholders to identify principles that they and both parties can support. “The chairman intends to bring the president’s proposal before the committee at a date to be determined,” Watkins said.